• Resale home values are up 11% year over year, according to the Burns Home Value Index™. 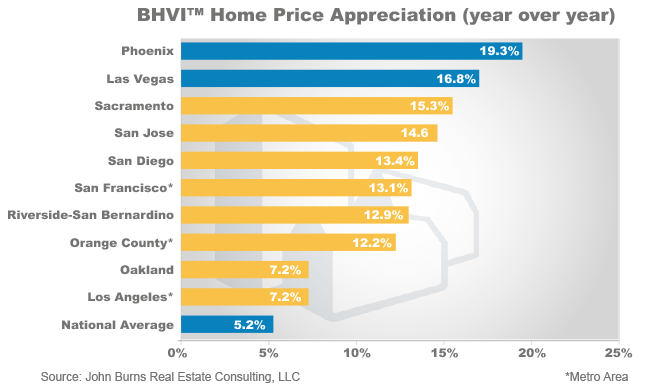 • California has 4 of the top 6 major markets with the most home value appreciation in the country. • Months of supply is currently 2.5, down from 3.5 a year ago (6 months is considered balanced). • 9 of 10 resale homes sold in San Francisco, Sacramento, and most major cities in Southern California have reportedly been drawing multiple bids. • Single-family permits are up 41% year over year, but are still just 33% of historical averages. • Foreclosure notices are at their lowest level since 2005 and are down 68% year over year (compared to a 28% drop nationally), some of which is definitely attributable to a new California law preventing dual-tracking foreclosures. According to the Burns Home Value Index™, prices have surged by 15% in San Jose and Sacramento over the last year, compared to the national average of 5.2%. Except for Phoenix and Las Vegas, these Northern California markets have seen the strongest price appreciation of any major metro in the country. In addition, home values have risen more than 12% since April 2012 in most major Southern California markets. Builders across the state are scrambling for land and often can’t build homes quickly enough to keep up with demand. In recent months, builders have acquired hundreds of home sites in the Sacramento suburbs, as well as Southern California’s Santa Clarita Valley, with plans to open new communities. Even many of the worst submarkets in Northern California have seen a significant increase in lot prices since the price trough in 2011-with price growth averaging close to 50%, according to our Burns Finished Lot Value Index by market. Reminiscent of the 2005 peak, builders are using tiny releases and selling them right away through lotteries and occasionally campouts in some of the most desirable locations. According to our recent survey of home builders, average new home sales rates per community have increased 53% in Southern California and 57% in Northern California from a year ago. 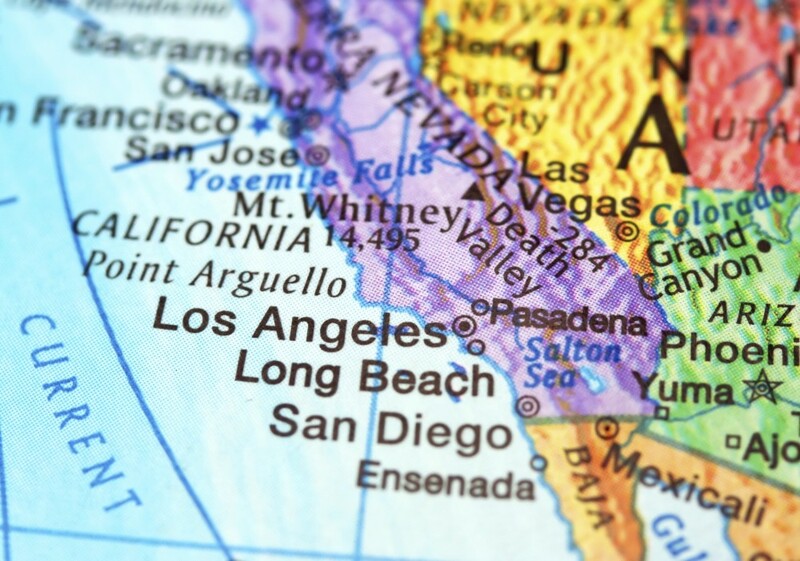 Many analysts are concerned that elevated investor activity is driving the housing recovery in California, creating bubble-like conditions similar to those in the mid-2000s. Investors are indeed driving a speedy recovery, and the Fed is indeed providing a lot of stimulus. However, prices are not out of line with incomes in most areas. A bubble? Not today, but maybe someday. Many of the somewhat famous bears who called the peak were calling for a downturn as early as 2001. That is hardly great advice. • Boomerang buyers, defined as buyers who lost their home through foreclosure or short sale from 2007-2012, have just started re-entering the market. We estimate that there are approximately 500K of these buyers state-wide. • New home supply remains limited, especially in coastal locations. In heavily regulated California, the land entitlement process is generally really long and expensive. • Although unemployment remains elevated in California, job growth is currently 2.5% year over year (compared to 1.7% for the nation as a whole). • The California’s Homeowner Bill of Rights, which took effect in January, makes it easier for people to modify a loan and stave off foreclosure. The law has already had an impact, as foreclosure activity dropped nearly 50% in the first quarter of the year. This law will further reduce distressed resale inventory in the short term, while allowing struggling homeowners to move into positive equity positions as prices continue to rise. One thing is for certain, as summer approaches, California’s housing market shows no signs of cooling down.